As all of you are perfectly aware (I’m sure), the iPod cannot display hebrew. This makes finding that one Shlomo Artzi track specially difficult. This is very annoying because it forces you to translate (either literally or phonetically) the track names to the English alphabet. 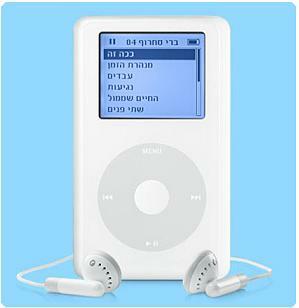 Well, Ido Mendelson has come up with a way to get the iPod display hebrew. But apparently Apple Israel (Yeda) has decided it voids your warranty (what???). Anyway, there’s a petition in case you care. I don’t know yet if I’ll try it… I’m thinking about it though but it’s not clear what it actually does… pressumably it simply replaces the font file in the iPod? Can’t find my Shabak or my Dag Nachash! Spare me a copy of HebPod, would you? i need hebpod anyone have the dwnld. my white anglo ipod cant read my sarit chadad or anything else. Is there any update on this topic, being more than a year after raised and petitioned for? I’m trying to dowload the Hebpod but all the links is not working. Can someone tell me where i can download it? ?